Few places are as spellbinding as the South Pacific, a seductive but somewhat jumbled series of islands and atolls spread across the world's biggest ocean. We check out the most exclusive hotels and resorts in a destination that delivers the dream with swaying palms, sugar-white beaches, turquoise-tinted waters, exciting aquatic action, and as much cocktail-drinking, hammock-lazing and seaplane-hopping as you can muster. 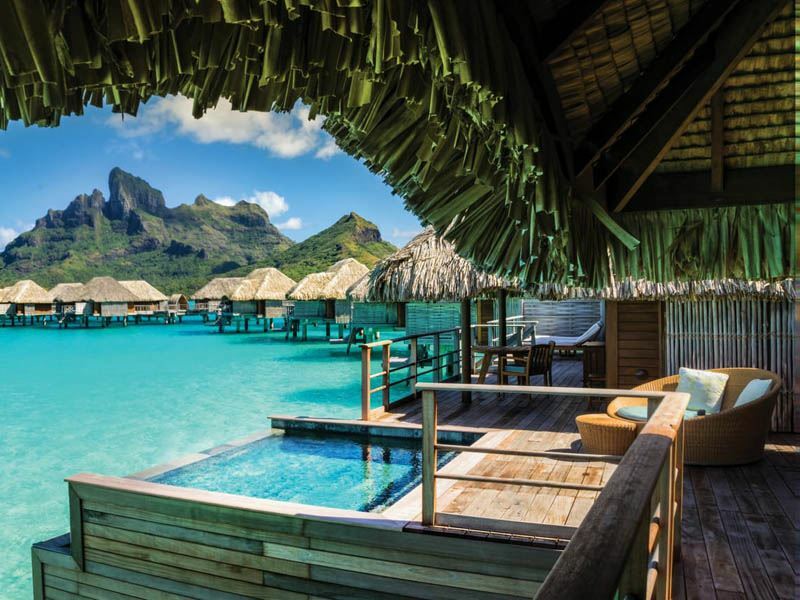 The scene: Sparking pure joy for luxury lovers, this glamorous resort ups the wow factor with a dazzling location at the edge of a lagoon in Moorea (part of French Polynesia's Society Islands archipelago). 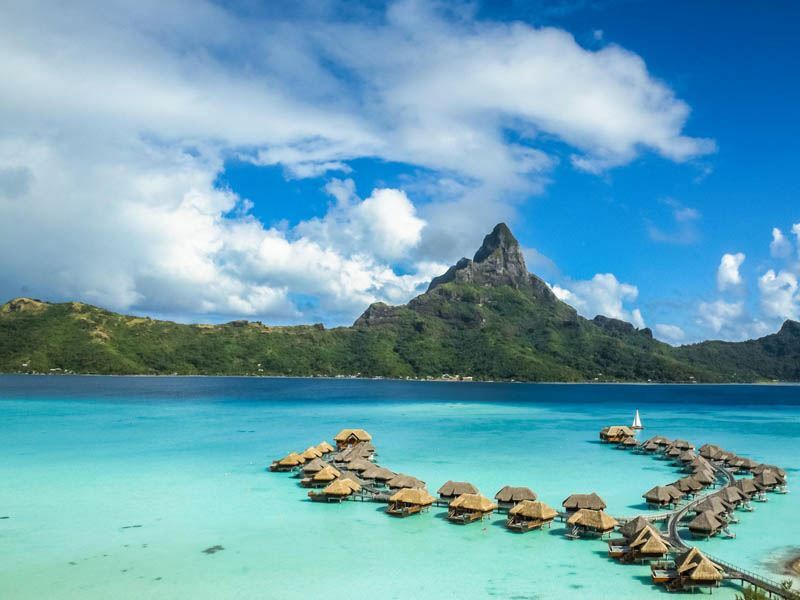 Not only will you enjoy sweeping views of Tahiti on one side and jagged volcanic mountains on the other, but there’s sparkling white sands and luminous waters in all directions. The sleep: Laid out on one level, the 112 thatch-roofed bungalows set over the water, on the beachfront, or surrounded by landscaped gardens offer sophisticated décor; think soaring ceilings, on-trend soft furnishings, soothing colour tones, and lashings of dark woods. Expect plush king-size beds with patterned headboards, generous seating areas, vast bathrooms with stone tile rain showers, and private terraces for uninterrupted views of the horizon. Nice extras include well-stocked minibars, tea and coffee-making facilities, and free Wi-Fi. The stay: The facilities are as oh-my as you’d imagine: idyllic outdoor pool lined with comfy sunloungers, private beach access, watersports, and Zen-like spa for treatments and therapies using pure essential oils and natural ingredients. And it’s just as fabulous on the food and drink front; not least at the insanely romantic K restaurant where kicking off your shoes, dipping your toes in the soft sand, and savouring gourmet French cuisine is very much in order. The scene: Strictly for grown-ups on a go-slow, this award-winning boutique retreat is set in a stunning forest of palm trees in Qamea, the lesser-known jewel of Fiji's northern islands (around two miles from the larger Taveuni). Blissfully peaceful and private, it offers rolling-out-of-bed access to a gleaming white-sand beach, a beautiful house reef, and a bird-filled lagoon creek. The sleep: Attention to detail is everything in the Fijian-style beachfront bures and villas, all of which have high ceilings, mahogany hardwood floors, thatch roofs, tropical-print soft furnishings, and four-poster canopied beds dressed with Egyptian cotton linens. There’s also flatscreen TVs with digital channels, tea and coffee-making facilities, free Wi-Fi, ultra-modern bathrooms, and outdoor terraces, courtyards, or gardens with hammocks. To tempt those with deeper wallets, some have Jacuzzi spa pools, lavish daybeds, and uninterrupted beach and ocean views. The stay: Tucked away behind the lagoon, the award-wining Jungle Spa (home to the only Guinot spa in the South Pacific) gets all the love for its next-level facials, body therapies, and island-inspired massages. There’s also a PADI-accredited dive shop, free watersports (kayaking, stand-up paddle boarding, snorkelling), guided jungle hikes, a lovely outdoor pool, and a restaurant and bar for Fijian fusion cuisine, afternoon teas, and anytime cocktails. The scene: Blissful ocean views dominate at this upscale resort along the glittering sands of Momi Bay Nadi on the western coast of Viti Levu, roughly 18 miles south of Nadi. Complete with a striking design centred around a man-made lagoon, the vibe here is less chain hotel and more ultra-polished boutique; not least for the staff who go the extra mile to make guests feel special. The sleep: While the lagoon and ocean-facing bures and villas at this serene sanctuary tick countless boxes for high-end comfort, minimalist-chic design, and mood-setting luxuries, it doesn’t get better than the overwater accommodation for bragging rights. Amenities include king-size beds dressed with sumptuous linens and pillow top mattresses, flatscreen TVs with digital channels, tea and coffee-making facilities, outdoor living spaces, and interiors that make the most of the natural light. The rooms with private plunge pools are worth paying extra for. The stay: As you’d expect from a big-name brand, the facilities are spot-on: tennis, watersports, three large pools (one with a swim-up bar, one just for grown-ups), private white-sand beach, 24-hour fitness centre, and tranquil spa. There’s also three restaurants for buffet and à la carte menus as well as an on-site deli and bakery for pastries and baked goodies. For those with children in tow, the Turtles Kids' Club offers supervised indoor and outdoor activities. The scene: For ultra-lavishness, this adults-only hideaway has it nailed with a beachfront location on Tokoriki, the picture-perfect island in the Mamanuca Islands. The silvery sands will have you fantasising about staying put for the duration, but if you’re feeling adventurous head to nearby Monriki Island to see where the Tom Hanks blockbuster, Castaway, was filmed in 2000. The sleep: The freestanding bungalows and larger open-plan villas pile on the luxe with Fijian-style décor, earthy colour schemes, tasteful soft furnishings, drop-dead-gorgeous views, and all the mod cons you’ll want and need. Whatever your choice of accommodation, you can expect a private terrace with sunloungers and hammocks, king-size bed dressed with high-quality linens, indoor and outdoor showers, and customised minibar. Some of the more upscale villas have swimming pools, ocean-facing decks, manicured gardens, and direct beach access. The stay: Away from the impressive sweeps of sand, you’ll find a splurge-worthy spa for all sorts of couples’ treatments, a splendid restaurant with a wealth of menus and dining options, and an eight-seater teppanyaki chef’s table for theatrical show cooking. Glass-bottom boat trips, complimentary watersports, tennis, nature hikes, and cultural events such as coconut demos, herbal medicine walks, and basket weaving complete the upscale experience. The scene: It’s all about relaxation and romance at this Relais & Châteaux-approved resort located on Motu Tautau, the secluded islet with the vanilla-scented island of Taha’a on one side and the silhouette of Bora Bora on the other. It’s easy to reach; just a 35-minute private boat journey from the airport on the neighbouring island of Raiatea (transfers are free). The sleep: Suspended above the lagoon, the stylish overwater bungalows are built with local materials (traditional thatch roofs, coral, bamboo) and feature a wrap-around deck with steps down to the bathtub-warm waters. There’s also a selection of divine beach villas, all of which have plunge pools set within walled gardens. All accommodation has Polynesian décor, king-size beds, shaded seating areas with daybeds, complimentary minibars, and Nespresso machines. Bathrooms have bathtubs, separate showers, high-end toiletries, soft bathrobes, and slippers. The stay: Food is taken very seriously in the three restaurants, all of which offer French, Polynesian and international creations. There’s also two bars for anytime drinks, a gorgeous spa for treatments infused with flowers and coconuts, a great-looking outdoor pool, and floodlit tennis courts. 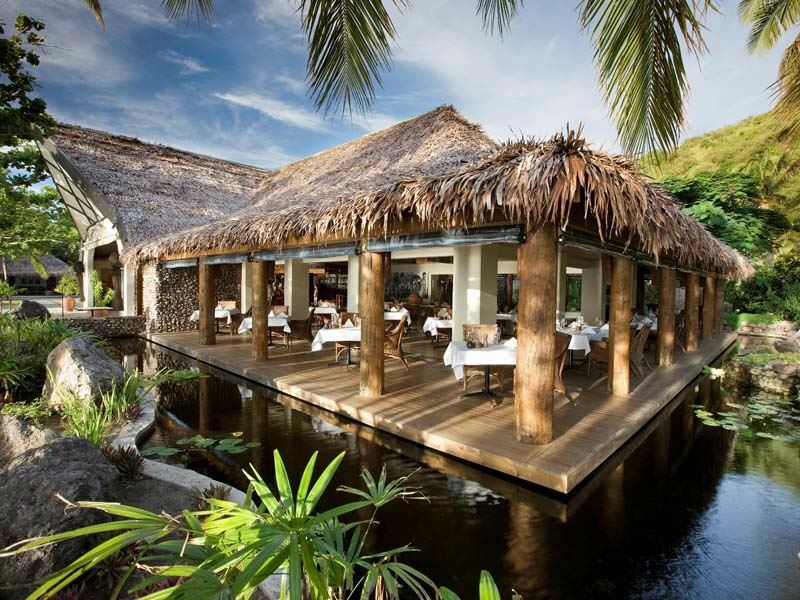 Equally worthy of your attention are the themed dance evenings, optional private picnics, and excursions to local pearl farms to see the black treasures Tahiti is so famous for. The scene: A desirable address on a sandy beach in the volcanic Malolo Island makes this adults-only boutique resort suitably spoiling and serene (its name means calm waters). Located around 16 miles from Nadi International Airport, it is reached by catamaran, speedboat, seaplane, or helicopter. 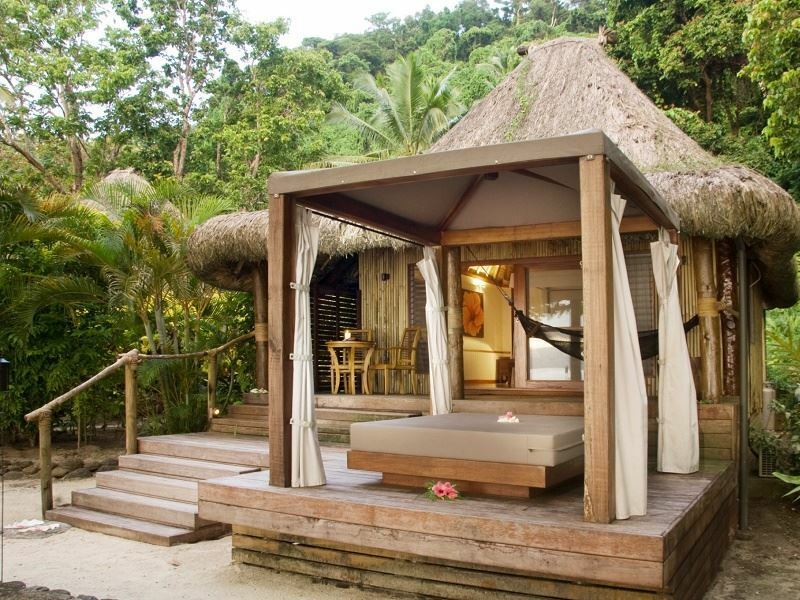 Most fabulously, this is home to the only overwater bures in Fiji. The sleep: For loved-up twosomes, the sumptuous overwater bures offer glass floor panels, direct ladder access to the lagoon, and panoramic ocean views from the private decks. The beachfront bures are equally glamorous havens of relaxation and feature indoor and outdoor showers as well as private plunge pools (some have their own bathing pavilions). You can also look forward to a king-size bed dressed with luxe linens, music system, tea and coffee-making facilities, Wi-Fi access, and delicious freshly-baked cookies every day of your stay. The stay: The infinity-edged pool will delight those keen to spend their days lying horizontally in the sun. There’s also an airy beachside restaurant for gourmet-style dishes matched with excellent wines, a couple of laid-back bars for cocktails, and a state-of-the-art gym for the fitness inclined. Equally impressive is the Tatadra Spa, a blissful sanctuary from which you can emerge in a dream-like state following a Fijian-style massage, coconut scrub, or banana leaf wrap. 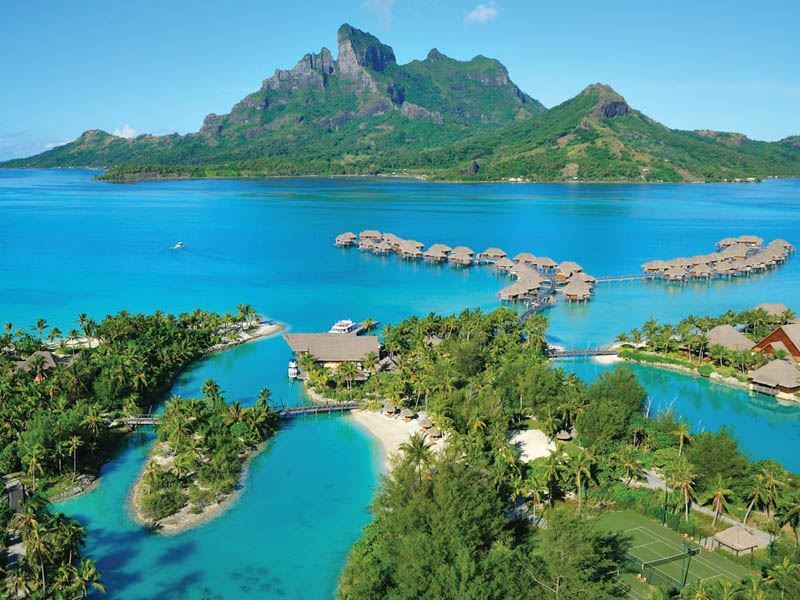 The scene: Setting the bar high for away-from-it-all stays along Bora Bora’s northern coastline, this award-winning paradise resort famously featured in the 2009 romantic comedy Couples Retreat. The surrounds are exquisite; think translucent lagoon, reshaped private beach, beautiful ocean, and the iconic peaks of Mount Otemanu that are seen from practically everywhere. The sleep: The villas come in all shapes and sizes, with many perched on stilts overlooking the ocean. Each tempts with customised Polynesian artworks, polished dark woods, comfortable king-size beds with crisp white linens, flatscreen TVs with digital channels, indoor and outdoor living spaces, and impressive bathrooms with sunken tubs, walk-in showers, and divine-smelling toiletries. Some have private pools, spacious terraces with dining gazebos, gorgeous gardens, and glass-viewing floor panels for watching the aquatic action below. The stay: Glorious island vistas aside, everything here warrants the price tag. There’s two pools (one with cabanas), three beaches (perfect for an afternoon swim or snorkel), a selection of smart dining spots for global-spanning cuisine paired with fine wines, and a 24-hour room service menu. Further thrills include a marine spa, fitness centre, lagoonarium with tropical fish, and free-to-borrow bikes for exploring the emerald hills flanking Mount Otemanu. 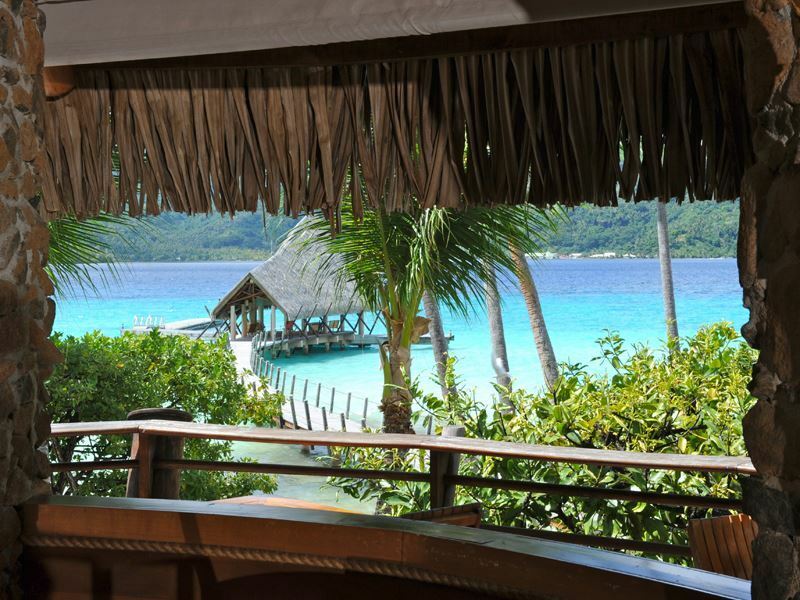 The scene: For that landed-on-a-desert-island feeling, this sophisticated eco-friendly resort is a paradise with a paradise located between the "two hearts" on Motu Piti Aau - one of Bora Bora’s tiny coral islets (it is accessible only by boat). At its centre is the unique Dr Treguer-designed thalasso spa, the very first of its kind in the South Pacific. The sleep: The collection of spacious overwater villas (none are on the beach) perched above the lagoon are worth the stay alone. Complete with unique vistas, all have split-level sundecks, freshwater outdoor showers and separate bathtubs, king-size beds with high-quality linens, flatscreen TVs, and comfortable living areas. Further amenities include DVD and CD players, free Wi-Fi, iPod docking stations, and glass-bottomed coffee tables with removable tops for checking out the rich marine life below. The more salubrious villas have private pools. The stay: While the setting is an instant wow, the facilities leave a lasting impression: themed restaurants and bars, tennis courts, exciting watersports (kayaks and stand-up paddleboards are free), and lagoonarium with resident marine biologists. And then there’s the much-hyped Deep Ocean Spa - a not-to-be-missed sanctuary complete with aquatonic seawater pool, hydrotherapy and beauty areas, fitness and aerobic rooms, and personal trainers. The scene: A sand-fringed idyll in the shadow of Bora Bora’s Mount Otemanu, this resort does luxury on a grand scale - but without compromising on style. Set on its own private island in a lagoon surrounded by lush foliage and coconut palms, it’s the perfect spot for toasting sunsets, swimming in luminous waters, and sipping champagne under the Tahitian night sky. 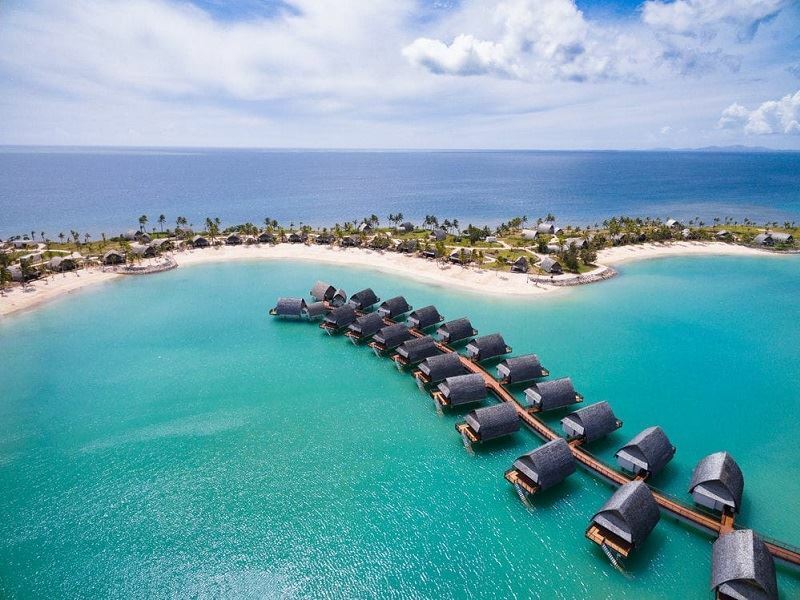 The sleep: The scene-stealing overwater bungalows and the secluded one, two, or three-bedroom beachfront villas both have well-sized living rooms, teak furniture, classic décor with mother-of-pearl accents, and customised artworks. You’re spoilt further with plush king-size beds with down or anti-allergy pillows, outdoor decks with showers, free Wi-Fi, oversized soaking tubs, seating areas, and free-to-use snorkelling gear. Some villas have their own private plunge pool. 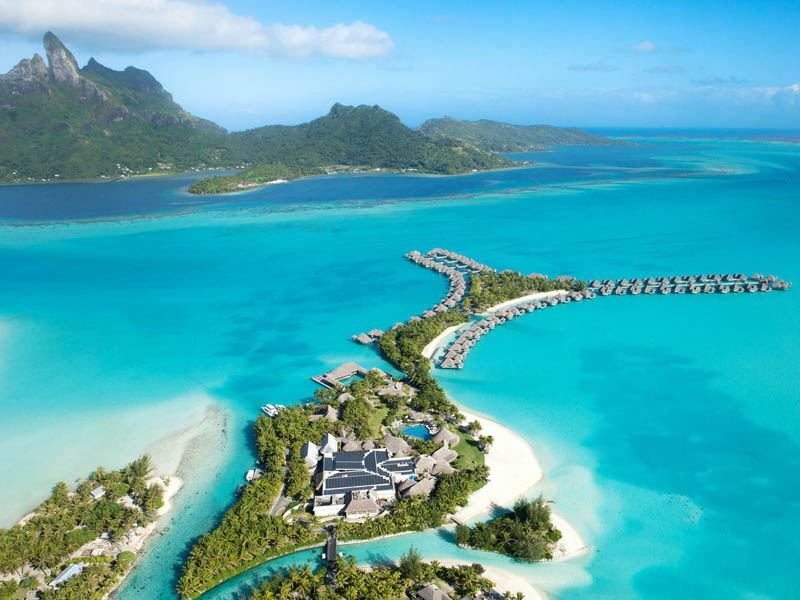 The overwater bungalows have direct access to the lagoon waters. The stay: There's a wave-shaped infinity pool lined with thatch-roofed cabanas, free watersports (including kayaks and stand-up paddleboards), state-of-the-art fitness centre, volleyball and badminton courts, yoga classes, and a resident marine biologist. The resort also features four exceptional eateries, a relaxed beach bar for cocktails, and an excellent spa for a wealth of holistic treatments and therapies using coconut oil, vanilla, and black pearl powder. 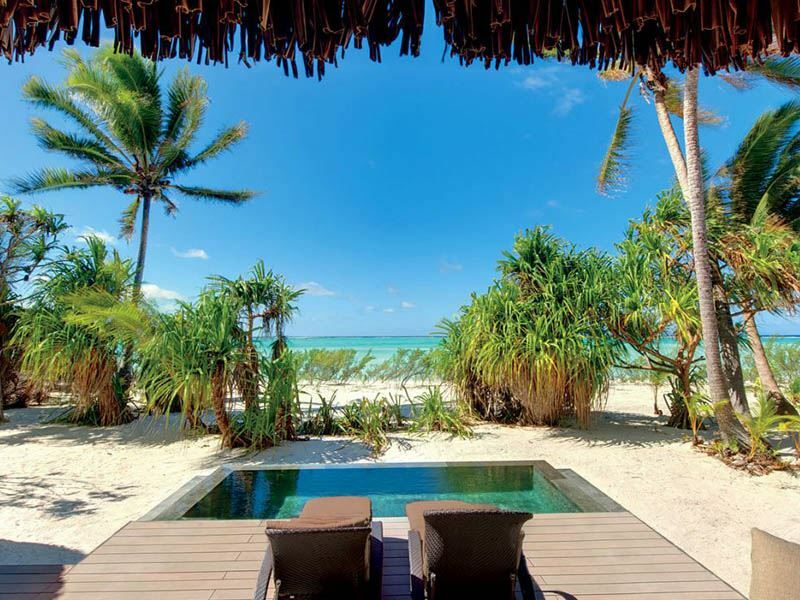 The scene: The former private retreat of Marlon Brando (the actor fell in love with it after visiting nearby Tahiti to film Mutiny on the Bounty in 1963), this luxe resort is set on Tetiaroa Atoll - a slice of paradise made from 12 low-lying islets. 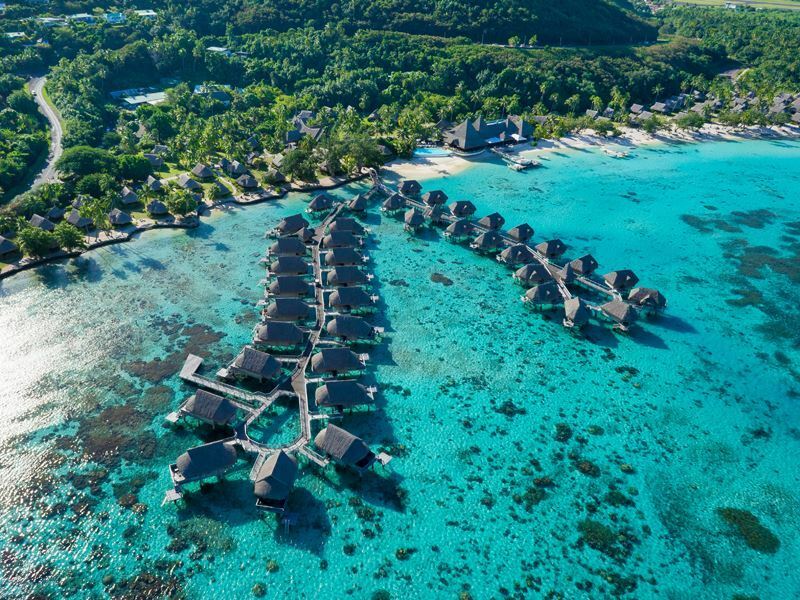 It opened in 2014 (a decade after his death) with an aim of preserving and protecting the atoll while offering guests somewhere fabulous to sleep. The sleep: There’s 35 standalone one, two or three-bedrooms villas, each with a private pool just a few steps from sparkling waters and white sands. All have a king-size bed (twins on request), spacious living room, media room, and covered outdoor dining area with beanbags and daybeds. There’s also plenty of thoughtful add-ons, including 24-hour room service, free-to-use bikes, and coral-friendly sun tan lotion. The adjoining bathrooms feature outdoor bathtubs set behind wooden screens. Some of the larger villas have a well-equipped kitchen. The stay: Drag yourself away from the sands and you’ll find a splurge-worthy spa for all sorts of feel-fabulous pampering, two splendid restaurants for French cuisine or Polynesian fare, and a bar with private tree-top seating areas for kicking back with a cocktail. There’s also a memory-making land and water activities galore, including snorkelling, scuba diving, deep-sea fishing, kayaking, bird discovery tours, nature trails, fitness classes, and visits to the island's eco-station.